In 2008, almost overnight, Americans were told the economic system was on the verge of collapse and needed a one-time bailout. Congress quickly passed the Troubled Assets Relief Program (TARP). Interest rates dropped to historic lows. This was to jump-start the economy and interest rates would quickly return to normal. Eight years, and several bailouts later, we still have historically low rates, high debt, a terrible economy while baby boomers scramble to make ends meet. I’m still haunted by the movie, “The Big Short”. The following graphic appeared on the screen and a conversation took place in the background. It was a conversation between two high-level investment advisors. “There’s gonna be a bailout!” one exclaimed. The other responds, “The banks knew it all along”. The banks knew they could take unfathomable risks because the government would bail them out at the expense of taxpayers. In his book, “Don’t Bank on It”, Craig Smith tells us we were warned. “I too have been a close observer of the Bank of the United States…. I have had men watching you…. and am convinced that you have used the funds of the bank to speculate in the breadstuffs of the country. Nothing has changed; banks keep the profits and stick taxpayers with the losses. Maybe the snail was surprised but the rest of us had plenty of warnings. We are hearing political debate about the Glass-Steagall act, a law passed in 1933 and repealed during the Clinton administration in 1999. “Glass-Steagall had long separated commercial banks (which lend money) and investment banks (which organize the sale of bonds and equities)…. Commercial banks are not supposed to be high-risk ventures; they are supposed to manage other people’s money very conservatively. It is with this understanding that the government agrees to pick up the tab should they fail. Investment banks, on the other hand, have traditionally managed rich people’s money-people who can take bigger risks in order to get bigger returns. The repeal of the act goosed the accelerator and created a small number of huge investment banks. CNBC tells us “Five biggest banks now own almost half the industry.” I’m sure the political class would continue to label them, “Too Big To Fail”. For both sides of the political debate, click here and here. 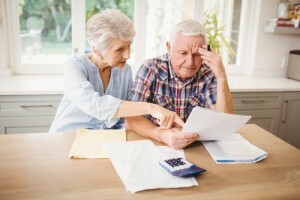 Big Brother’s bank bailouts are bankrupting baby boomers and retirees. It’s now impossible for an individual or pension fund manager to generate enough risk-free income to provide for a comfortable retirement. Why? Because the Federal Reserve and political class decided protecting the banks was more important than protecting seniors and savers. The Wall Street Journal tells us “Public Pensions Roll Back Return Targets” with the average target now averaging 7.68% return. The least risky non-investment grade (junk) bonds average effective yield is around 5.85%. How much risk do pension fund managers need to take to hit their 7.68% target? You don’t have to be a snail to see that some will make bad decisions and a lot of innocent taxpayers and retirees will suffer. They should call this the “Snail Protection Rule” so they can clearly see what’s coming. 2. The underfunded union managed Central States Pension Fund covering retired and active truckers, wanted to institute pension cuts. The government rejected the plan. Politicians wouldn’t want to bail out 250,000 union members with our tax dollars now would they? o What’s the difference between a rescue and a bailout? o Why does the choice always have to be rewarding those who made bad decisions at the expense of the hard-working US taxpayers? Why don’t they stop the insanity? The Zero Interest Rate Policy is not working and will not work. Why continue destroying the retirement dreams of many generations? The economic debate is between “Capitalists” and “Keynesian” economists. Capitalists believe in the free market system that has resulted in the highest standard of living the world has ever seen. It is not flawless as evidenced by the trust busting days in the early 1900’s. “The main plank of his revolutionary theory (emphasis mine) is the assertion that the aggregate demand created by households, businesses and the government and not the dynamics of free markets is the most important driving force in an economy. Theoretically government and central banks market intervention can make things all better. The European Union, Japan, China and the US have primed the pump with a fire hose and it’s not working. Could the theory be wrong? It’s never been proven to work. When the government and central banks intervene, they now have the power to determine winners and losers; it is no longer left to the free market. The bailout list is now 16 pages long and includes more than banks. The symbiotic relationship between the Federal Reserve and political class is a mutual protection scheme. The Fed’s low interest rate policy allows the politicians to spend freely to buy votes. Individual banks spend millions for political donations and speaking fees for selected, influential politicians. In turn the political class protects the banks. Politicians will continue to bail out banks and “privileged” blocks of voters to insure they stay in power. The injustice imposed on our society by the government and Federal Reserve is horrendous. Only political establishment snails should be surprised at the support for “non-establishment” candidates in our upcoming election. The public is kicking the rotten door and the political establishment is fighting hard to maintain their power. 1. Demand our elected officials break up the banks deemed “Too Big to Fail”. 2. Demand they stop using our money to reward bad decisions and penalize those who played by the rules and made responsible decisions. Our system allows us to fire these “people of privilege”. Voters can punish those who spend our money wastefully and reward those who don’t. The political class should be worried. 3. Accept the cold hard facts – we are responsible for our own financial health. Earn more than you spend, and save the difference. The government is not going to bail us out. We can’t change the past; however, like the turtle and the snail we can get our collective heads out of our shell and prevent another calamity! It’s time for Big Brother to break up the big banks and serve the voters. I try to end each week with something light. This week I must make an exception and say our hearts and prayers goes out to the families of those who were injured or killed by the recent terrorist attack in Orlando. An event of this magnitude used to unite our country against a common enemy. Instead the political class jumps on this tragic event for political purposes. While it’s a debate I prefer not to enter; we should remember the primary purpose of the federal government is “to provide for the common defense”; protecting our citizens from harm. The public is getting fed up with “political correctness”.